Megyn Kelly walked onstage in all black. Megyn Kelly began a segment with Joe Biden, as he is promoting his new book Promise Me, Dad. Megyn Kelly rolled tape running through Joe Biden’s life story. Megyn Kelly welcomed Joe and Jill Biden to the stage. Joe Biden spoke lovingly of his family. Megyn Kelly, Joe Biden, and Jill Biden spoke about their family for another block of the show. 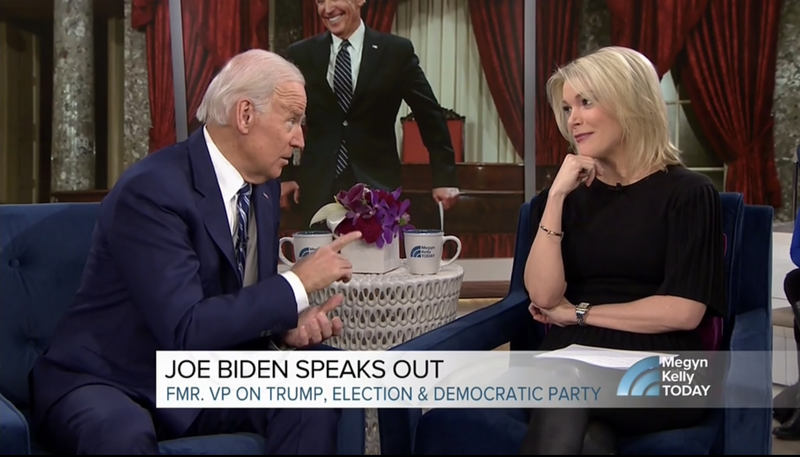 Megyn Kelly eventually asked Joe Biden about the 2020 presidential race. The audience laughed and laughed. Joe Biden refused to name names, but said he’s impressed by the number of new faces in the field. Megyn Kelly released Jill Biden, and kept Joe Biden on for one more block. Megyn Kelly said, “But you don’t cop to President Obama doing that occasionally, too? Megyn Kelly hugged Joe Biden and cut to commercial. Ali Raisman came onstage to discuss Larry Nassar, the team doctor she alleged sexually abused her—and countless others—for years. Aly Raisman discussed the investigation of Larry Nassar. Megyn Kelly thanked Aly Raisman for coming.